Please visit and READ THE INFORMATION AT THIS LINK FIRST. If this sounds like something you would like to be a part of, request your FREE patterns through our website form. This tutorial has been created to show you the best and most efficient way to create Teeny Tears diapers. It begins with a simple fabric cutting tutorial. Then directs you through the full sewing process from raw cut outs to ribboning sets together. 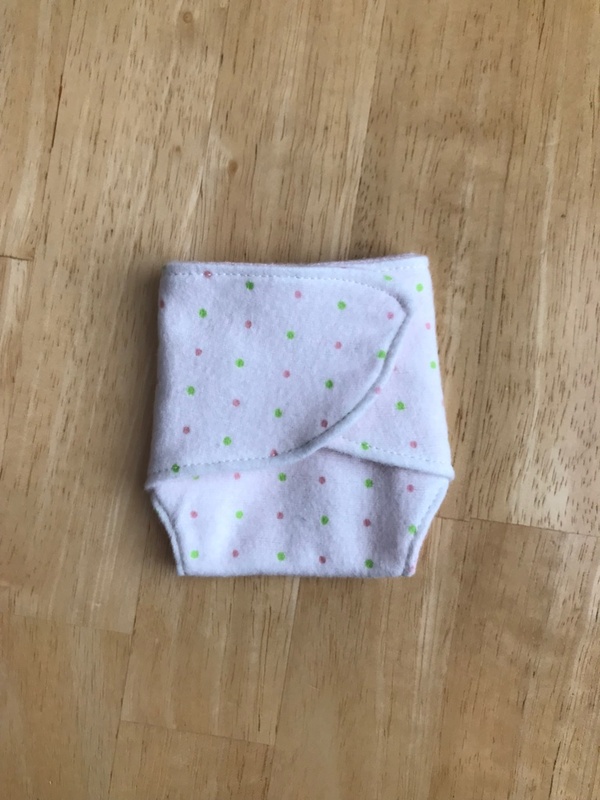 We hope this will answer any questions you have when creating Teeny Tears diapers from start to finish and help your quality be the best it can possibly be. Remember that diapers are donated in identical sets ribboned together with a distribution card. This is to ensure the family is able to clothe their baby and keep a diaper as a memento. 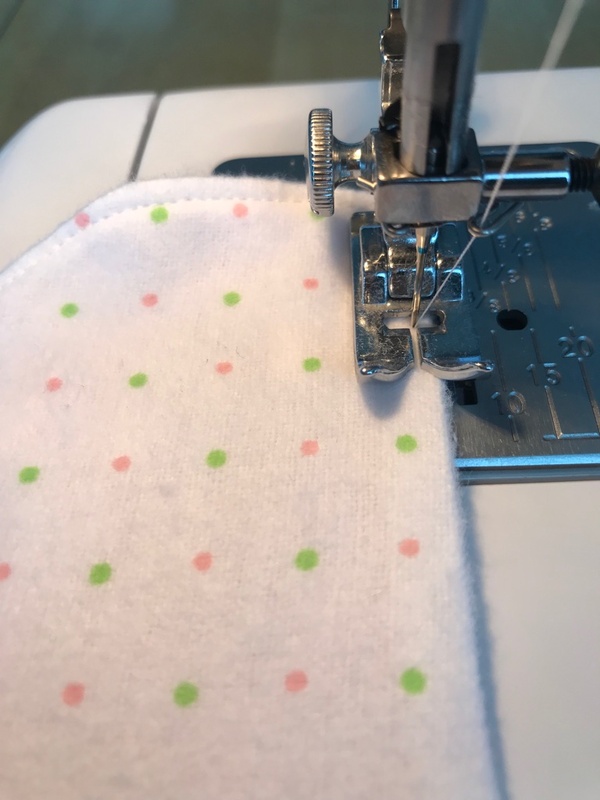 This portion of the tutorial will help answer some of the questions we have had regarding how many diapers you can get from one yard of fabric. It will show the way we get the best possible amount out of each yard. This is not the way you MUST do it, just what we are showing you as ONE OPTION. Materials you will need: Large Pattern(s), Small Pattern(s), Iron, Sharp Fabric Scissors, Marker or pen & Fabric. There is no need, nor do we recommend washing your fabric. These items will be used once and washing often leads to pilly and unusable fabric. #2 - After cutting off the selvedge edge you are ready to iron your fabric. Not all fabric needs to be ironed, however removing large folds and wrinkles result in the best diaper cut outs. # 1 - Start by cutting of the selvedge edge that often has the designer, company name, etc. on it. #3 - After ironing the fabric it is time to fold it. Always fold it “right sides together” which basically means you will fold it so the pattern faces the other pattern. Fold it once, than over again so there is 4 layers of fabric to be cut at one time. 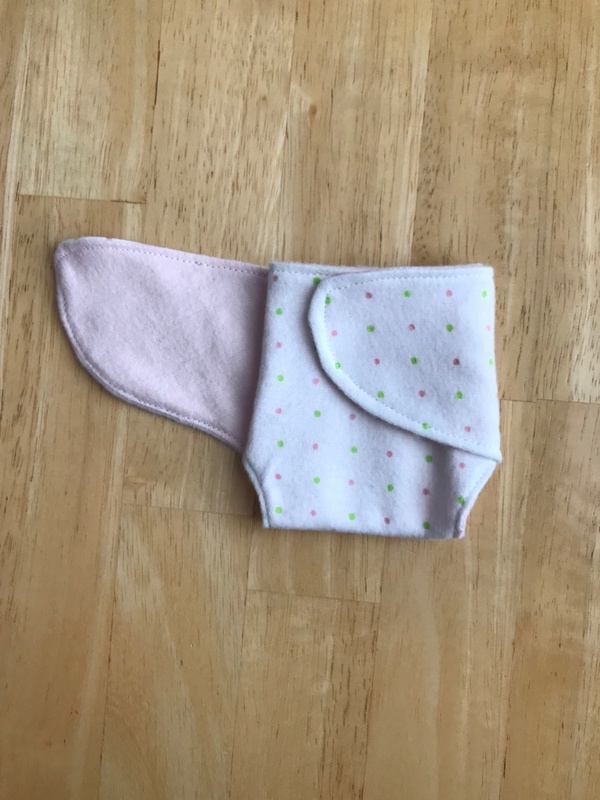 This will help you always have a matching set of diapers since you are cutting out four pieces which will make two diapers. #4 - After folding the fabric over twice smooth it out so the cut edges are as straight and lined up with the fabric underneath. If you look at the picture above you will see because of how the fabric was originally cut they do not all line up straight. With a cut along this edge you can straighten it right up, ready for the cutting of diapers. # 5 - Always start tracing from the cut edge to folded edge. If you have anything left over on the folded edge you may be able to get extra diaper cut outs from leftovers. Trace the big diapers, then squeeze in the little ones. #6 - Start cutting and try to keep it all in one continual piece. Once again often an extra diaper can be made from the leftovers. #7 - Open up the folds and see what you can fit. On this particular leftover 2 cut outs were available to use. Back them with a solid color and you have another complete set. Here is how the two extra cut outs would look when matched up with two corresponding solid colors. One single cut out was cut from the remaining pieces. 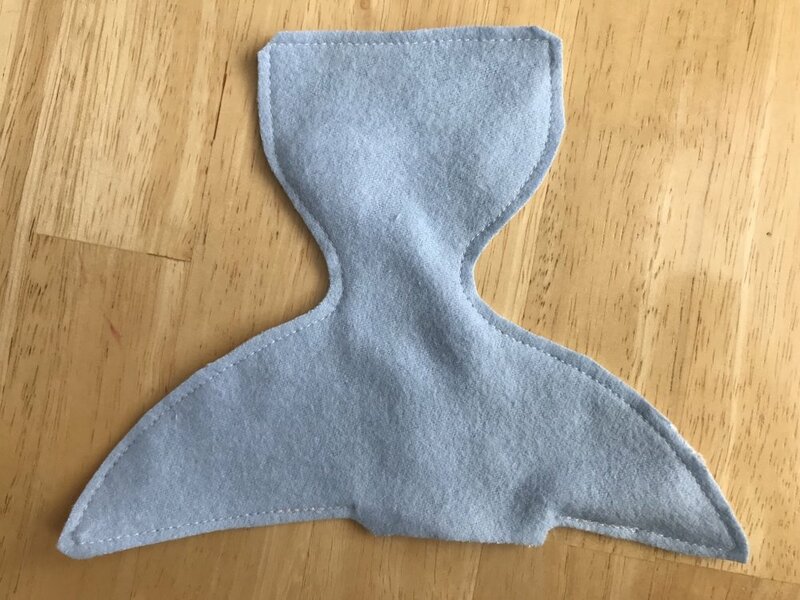 It can be backed with another fabric and given out as a sample diaper, to angel moms as a gift or to the siblings of angels. To understand the explanation of how to sew the diapers it may be helpful to understand the anatomy of our diapers. You can see above that both the large and small diapers have the same basic make up, but a different overall shape. The difference in shape helps with the specific gestational age our diapers serve. These diaper cut outs were photographed “right sides together” which is how the diapers are sewn during the first sew. 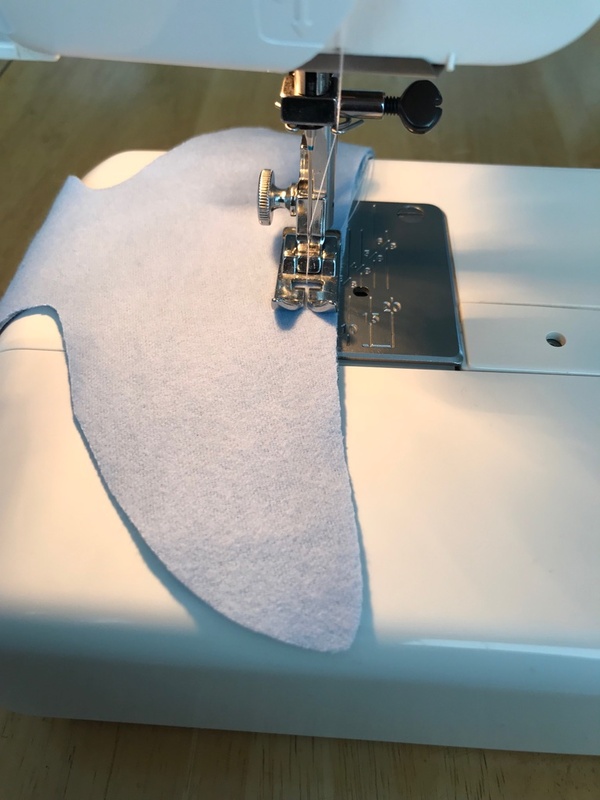 When starting with the sewing portion of the process you will need cut out diapers, scissors, a good quality WHITE thread and a sewing machine. THE FIRST SEW - Remember when 1st sewing you MUST sew with a 1/4” seam allowance all the way around the diaper. You will start about a third of the way across the back of the diaper. A back stitch is a great option when beginning this process. It helps the opening stay secure during the flipping process. It however is not a necessary step. Sew 1/4” all the way around the diaper leaving approximately a 2” opening at the widest part of the diaper. Do not be afraid of going too slow. A well sewn and shaped diaper is born in the 1st sew stage. The 1st sew process is the same exact thing whether you are sewing a small or large diaper. Start about a third of the way across the longest side (the back) of the diaper and sew the 1/4” seam allowance all the way around leaving approximately a 2” opening at the widest part of the diaper. A little tip: put your needle down and pivot the diaper to get around those sharp corners. Remember when 1st sewing you MUST sew with a 1/4” seam allowance all the way around the diaper. You can see in the image an example of how the diaperS will look with the full 1/4” seam allowance sewn. Take note of the opening on each size of diaper. This opening will be used to turn the diaper inside out. 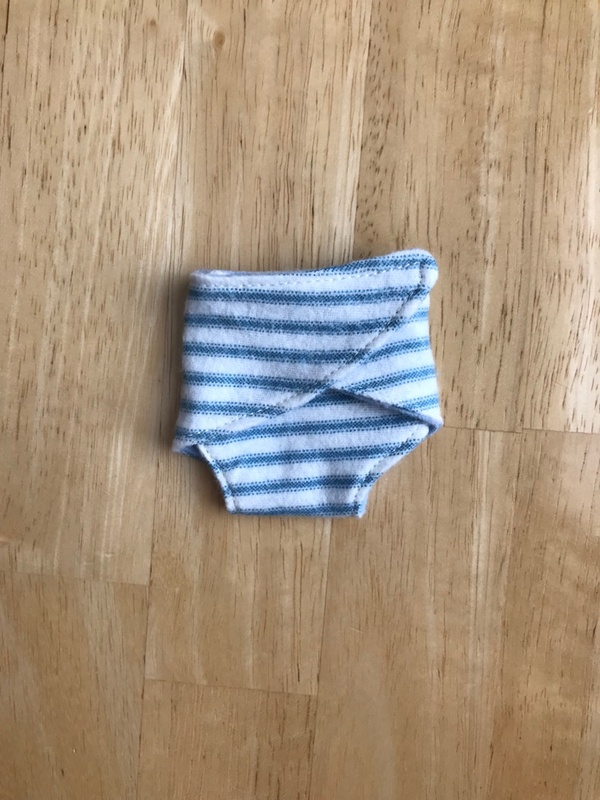 There are so many little tricks you can do to get THE BEST looking diaper possible, but none are as good as trimming the diaper before flipping. This step is A MUST. 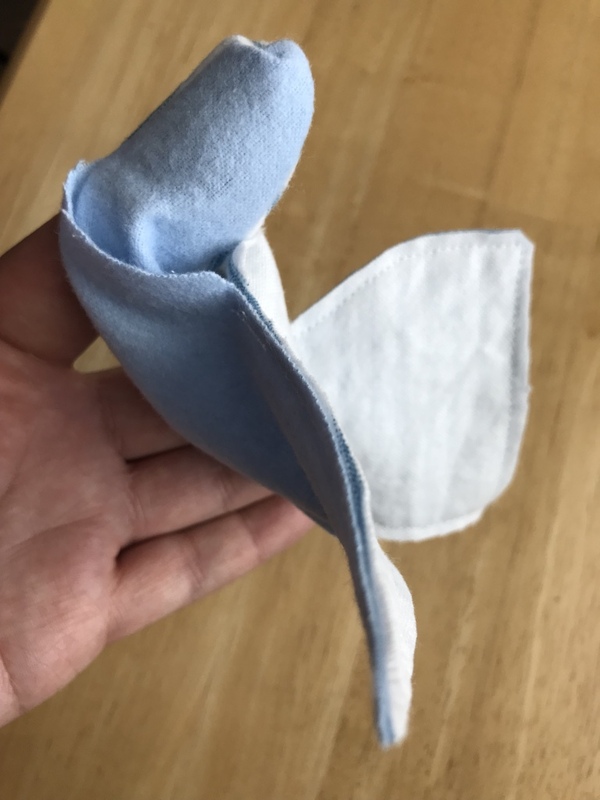 It cuts down on the bulk found on the inside of the diaper which makes the diaper lay flat and pin much more easy than not being trimmed. It also creates crisp corners and round edges exactly where they need to be. PLEASE DO NOT SKIP THIS STEP. Trimming is exactly how it sounds and looks. Start on one side of the opening in the longest part of the diaper. You will trim all the way around the diaper EXCEPT across the opening of the diaper. Do not trim across the opening. Trim halfway between the sewn line and the edge of the diaper for best results. Always clip the corners. Here is what you diapers should look like right before the flipping process. You can see how close they are trimmed, how the opening hasn't been trimmed across and how the corners have been snipped for the best possible looking diapers. You will also see the preferred flipping tool at Headquarters. We prefer the flexibility of a simple, cheap and plastic paint brush. Flipping is just what it seems to be. It is turning the diaper inside out. Start with the arms of the diaper by slowly turning them inside out with your fingers. You will want to poke out and smooth out every single piece of the diaper using your turning/poking implement. By doing that, you will get a diaper very similar to the one on the far right. 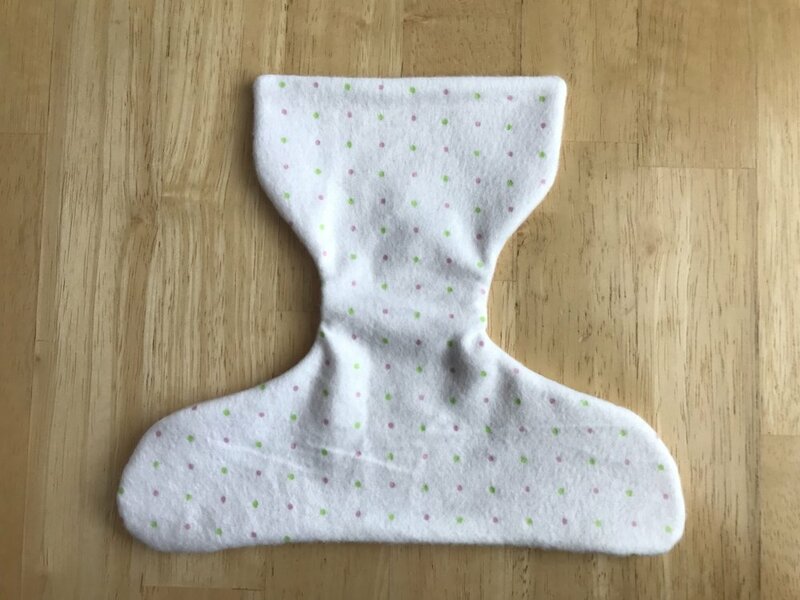 After poking out the “arms” of the diaper you will proceed to turn the rest of the diaper inside out. Use the poking tool to get the best results. Don’t forget to tuck in the opening flaps found on the longest side of the diaper. Once this has been done and the diaper is fully flipped you will be ready to iron the diaper preparatory to final top-stitching. The large diaper flipping process is just exactly like the small diaper. Make sure every little corner is pressed out and ready for ironing. Ironing the diapers is exactly what you would think. 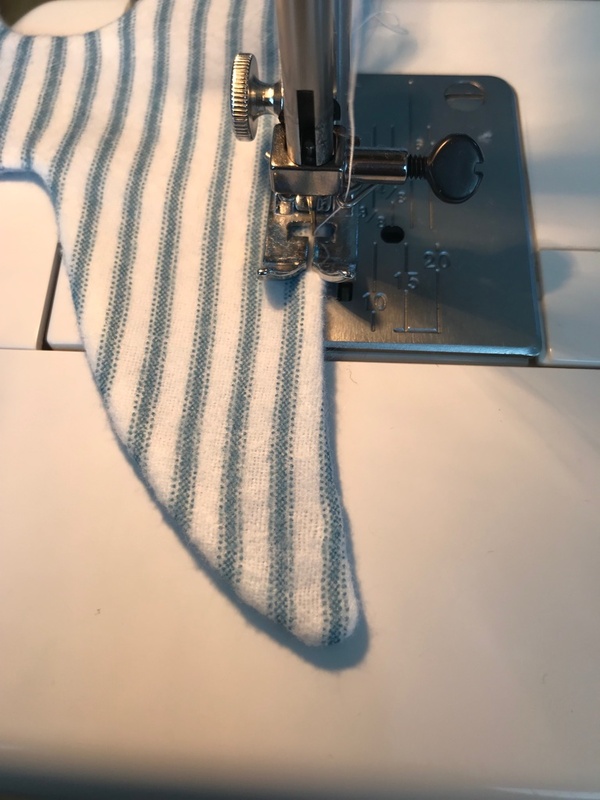 You are trying to press the diapers flat and crisp so they can look even better when top stitched. It is known that the highest quality diaper is won or lost on the ironing board. Top stitching the diapers is an integral step to making the diaper look professionally finished. It also closes the hole that you used to flip the diaper inside out. 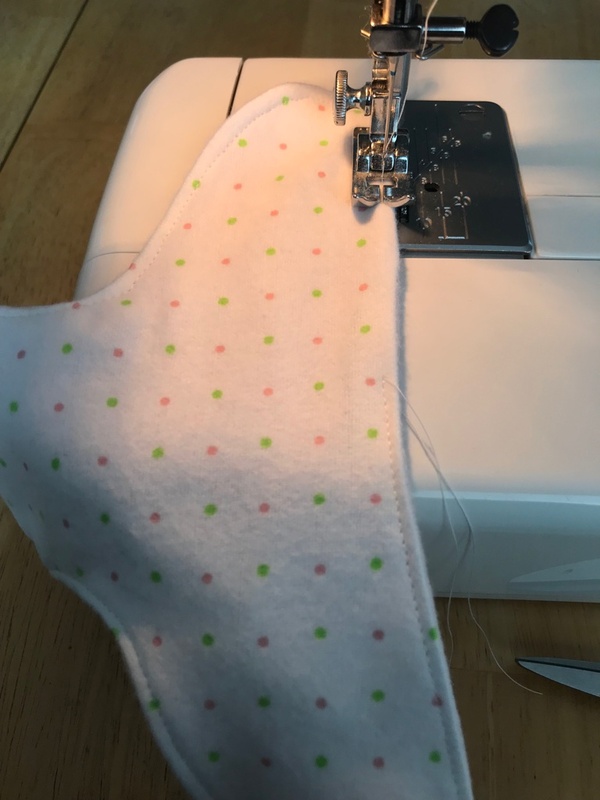 You do not have to top stitch super close to the edge, however we would like you to get close enough to fully close the hole and complete the diaper. Please top stitch around the entire diaper. Also use white thread for your top stitching. White thread makes the stitching look uniform and does not distract from the overall finished look of the diaper. We STRONGLY discourage using colored threads for topstitching. 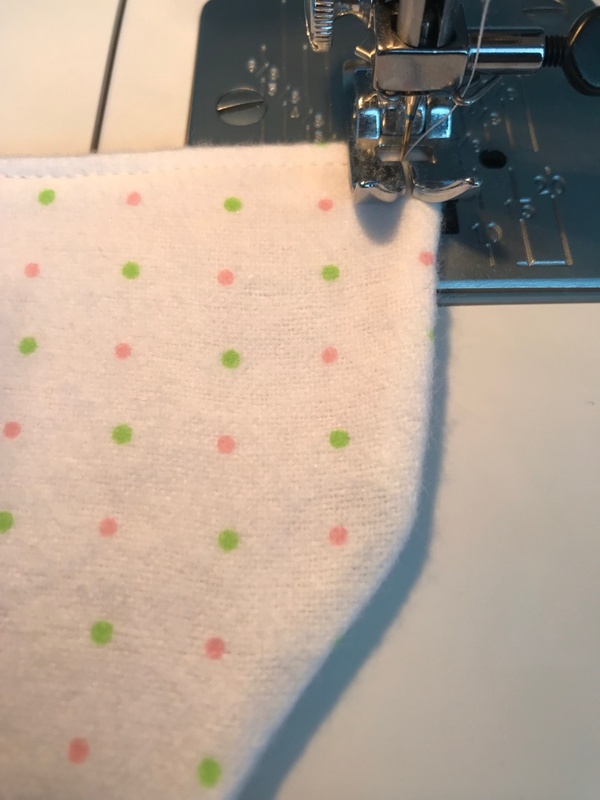 When pinning you want your diapers to be as square as possible when you are done. If they are more compact the ribbon stays on it much better than if they are triangular. 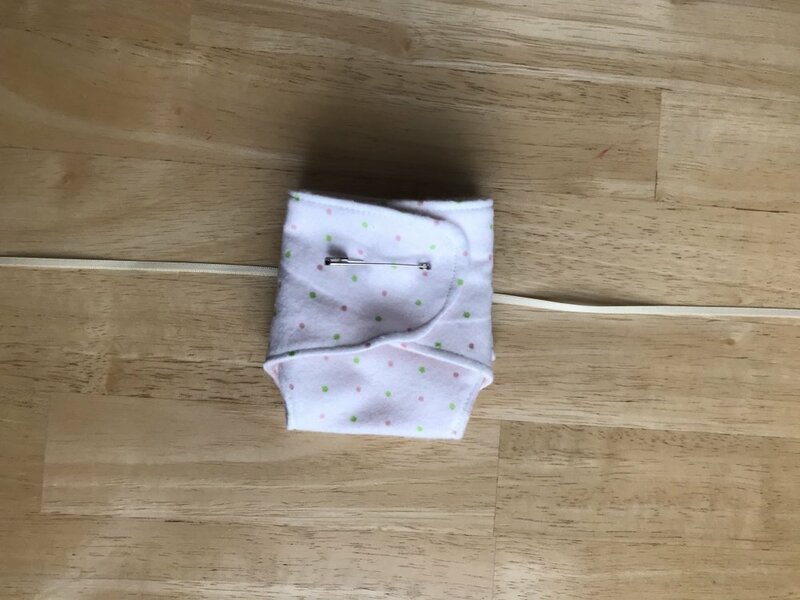 To fold the diapers fold the diaper up so the front meets the back. Then fold in the small wings on the front of the diaper. Complete the pinning by overlapping the arms. Pin through all the layers of the folded diaper then back through the front of the diaper for fastening. Click the safety pin in place and you are done! This method is exactly the same for the large diapers. We recommend an 18” long ribbon for the small diaper sets and 22” of ribbon for the large sets. 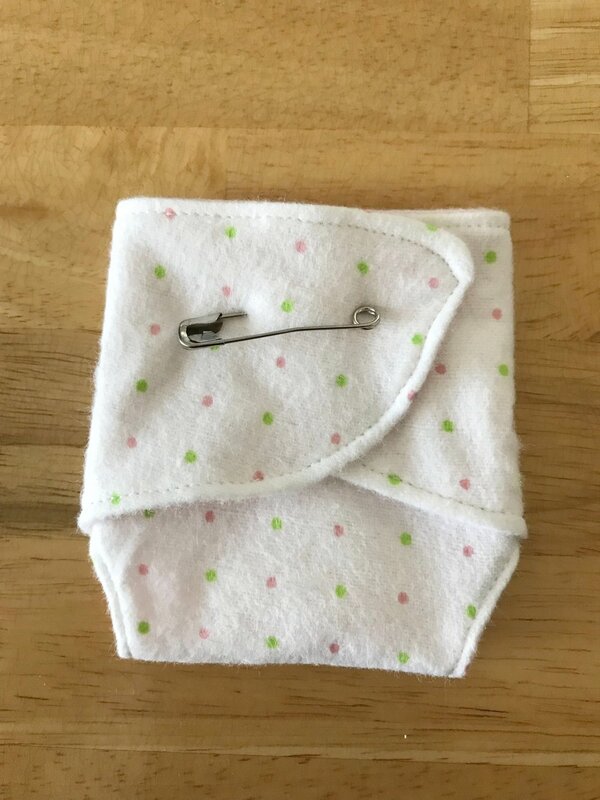 We also always use a #2 safety pin which measures 1 1/2” long for both the large and small diapers. What you choose to use is up to you, however a well tied bow is the best way to keep two diapers together. 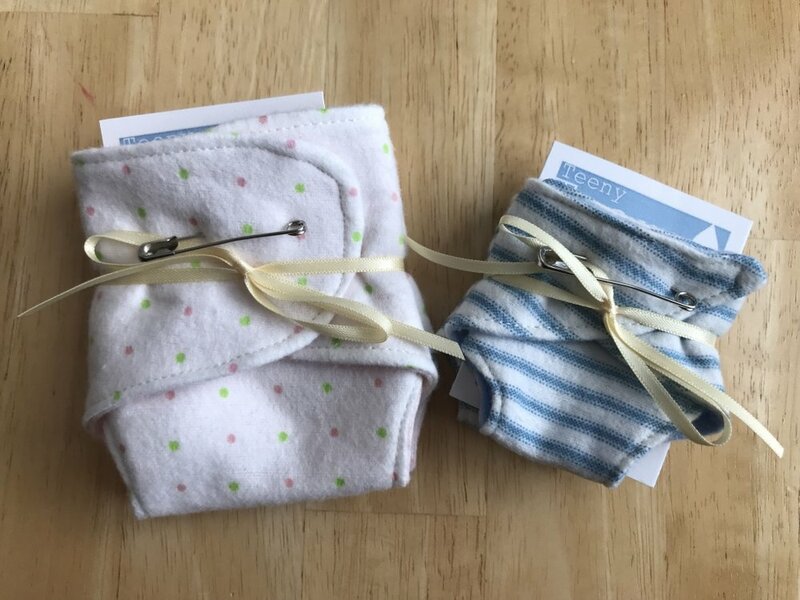 Once ribboned, the card is placed inside the diapers for safe keeping and you are all done!